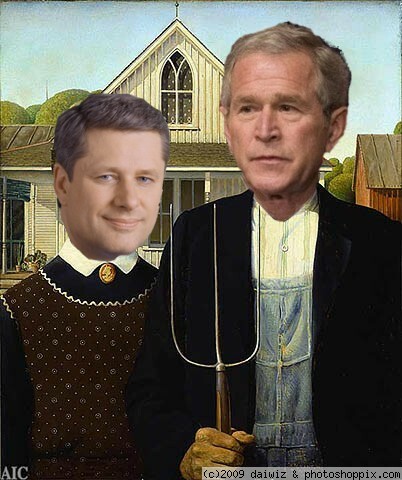 As a Canuck, it`s an odd experience to watch Stephen Harper operate using a game plan lifted from the playbook of one of the more discredited politicians of our time: George W. Bush Jr. A man who has been vilified for his emptying of the U.S. treasury, starting two morale sapping wars, spying on Americans, outing a CIA agent, staining his country`s reputation by sanctioning rendition and torture, but the worst thing he may have done is to divide his nation into two separate camps both angry and distrustful of each other. A state of affairs that sadly exists to this day. Seems Harper was paying attention it seems and is seeking to emulate Bush in every manner possible -- I mean how else can you interpret his actions? On Monday came a report from the Globe and Mail that the Tories were happy with the divisive nature of the gun-registry debate seeing it as a way to pick up disgruntled rural voters from the opposition. This explains why they`ve ignored repeated offers of compromises on the registry could be changed to reflect rural concerns. They don`t care about the issue -- they`re playing at dog-whistle politics and you can bet money that they will employ it again during in the forthcoming election. Yesterday there was the story about highly personal information including confidential medical and financial information belonging to an outspoken critic of Veterans Affairs, Sean Bruyea that found its way, including part of a psychiatrist's report, into the briefing notes of a cabinet minister. Mr. Bruyea uncovered the documents as part of a 14,000-page Privacy Act request about himself. He asked for the information in 2007 to discover why certain medical coverage by the department was denied to him. Among other things, he found his file had been accessed by hundreds of federal bureaucrats, including policy makers. Then there`s the story that`s all over the Canadian blogosphere but has received little notice in Canada`s MSM, about Alex Hundert the G20 activist who was rousted and dragged to jail by the police. Hundert had returned home to his residence at 10:30 pm after speaking at Ryerson University when he was arrested by seven Toronto police and RCMP officers, Seven!!! He is being incarcerated at Metro West Detention Centre for an alleged breach of his bail condition of non-participation in public demonstrations -- speaking at a University conference is now apparently a public demonstration. Then there's the steady drumbeat of, lions and tigers and bears oh my! The Tory version of course is a bit different. It goes, Liberals, and Socialists and Separatists, oh for pity`s sake don`t let them govern or western civilization will end and the terrorists will win! Intimidation, bullying and fear. That`s the GWB jr playbook in a nutshell. For some reason I'm reminded of the tactics used against Richard Clarke and Joe Wilson and anyone else who stood in the bushies way. Are Canadians and the Canadian press going to let them get away with this would be my question about Harper's playbook? Is anyone noticing the slide into American style he/said/she said rhetoric?